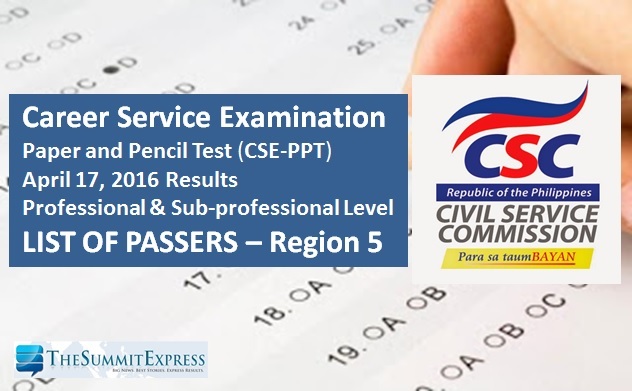 The Civil Service Commission(CSC) announced that 1,358 out of 12,646 or 10.74% successfully hurdled the Professional Exams while 174 out of 1,470 or 11.84% passed the Sub-professional Exams in Region 5. CSC officially announced results on Thursday, May 26, for the April 2016 Civil Service Exam - Paper and Pencil Test (CSE-PPT). Below is the full list of successful examinees for Region 5 (Bicol Region) civil service exam (CSE-PPT) professional level.